The camo trend is back in fashion, and it’s not just for the hunters anymore. Since 2015 the classic camouflage pattern has become nearly as popular with style fashionistas as it has always been with outdoor and sports enthusiasts. Drinkware, blankets, flashlights, caps, bags, coolers … almost anything you can imagine as a gift for your upcoming fall/winter giveaway is available in a camo pattern and can be decorated with your company logo. And since camo is increasingly popular with the female demographic, suppliers are offering more exciting products geared to women. Form-fitting tees; jackets with neon pink trim; and trendy totes are among the many products that make an outdoor-theme giveaway just as appealing to the ladies as it is for the men. The camo trend is perfect for fall promotions. When you’re on the hunt for new customers, give a camo pattern giveaway to stand out from the crowd. The good news: Summer is here! The bad news: So are the bugs. Even before all the disturbing news about the Zika mosquito, the summer battle against insects has always been annoying for anyone that likes to enjoy outdoor activities. However, now that the stakes are higher with the increasing health dangers that come from a simple mosquito bite, it’s a good time to arm your customers and employees with effective weapons to keep them safe. Insect Shield T-Shirts: with insect-repelling technology that lasts the expected lifetime of the product. Available in short sleeve, long sleeve and youth sizes. Natural Insect Repellent Wipes: certified to fight Zika spreading mosquitoes. No DEET; allergy tested; non-irritating; good for adults and children. Insect Repellent Spray & Lotion: formulated with no harmful DEET. Convenient sizes and available with naturally organic ingredients. Mosquito Repelling Wristband: easy to use; won’t stain clothing; no DEET; safe for kids; made in USA. Mosquito Repellent Button Stick-On: perfect for hard hats; no DEET; eco friendly; made in USA. All of these items can be decorated with the corporate logo, and are priced at budget friendly levels. Companies looking to increase their brand awareness at a time when the whole world (literally!) is looking for ways to stay safe from disease carrying mosquitos should consider one of these valuable weapons for their summer giveaways. What Is A Logo Merchandise Program? The Merriam-Webster simple definition of the word program is “a plan of things that are done to achieve a specific result”. That definition, though broad, provides the starting point for every discussion around a corporate logo merchandise program. Most corporate marketing departments recognize the need for branded merchandise and the value it brings as an important part of every campaign. Product giveaways with a well-executed logo decoration help to build brand awareness and stronger relationships with the audience. And when those products are viewed as part of the larger marketing plan; considered and discussed at the same time the team is outlining the campaign goals; and delivered in tandem with an event or a specific initiative, that’s when the program is born. Logo merchandise programs vary in size, scope and budget. A program for a company that has an ongoing need for easy access and ready availability of product in quantities as low as one piece would normally be managed as an on-line company store. However, that company may also have a need for a workplace safety program that is separate from the company store, and a tradeshow/event program that allows for drop-shipping larger quantities of giveaways directly to the event site, without depleting the stock in the fulfillment program. One logo merchandise program is seldom enough for these larger companies. If we follow along with the Merriam-Webster definition of the word program, a logo merchandise program is your plan of things that are done to achieve your specific result. So the task of the marketing team is to identify the type of program needed; source, evaluate and integrate the right logo products; and execute the plan. The results will follow! Some things never go out of style. Converse sneakers, Ray-Ban Wayfarer sunglasses, the little black dress, a crisp white shirt … and flannel. Flannel was introduced in the 17th century and has enjoyed a popularity that transcends social gaps and genders, making it one of the most timeless of fashions. Today’s updated versions of flannel pants, boxers, scarves and shirts are more fitted and are available in fashion-forward colors that any corporate marketing team can embrace. Logos can be applied in a subtle tone that compliments the item, and will remain a constant reminder of the giver while increasing the number of brand impressions every time it’s worn. Whether you are marketing to young adults, outdoor enthusiasts or the college crowd, giving flannel attire at the start of the winter season makes a clear statement about your company’s attention to the timing and usefulness of a gift that stands far apart from other more common giveaways. Warm up your audience with flannel this season, and enjoy the brand appreciation that’s sure to follow. 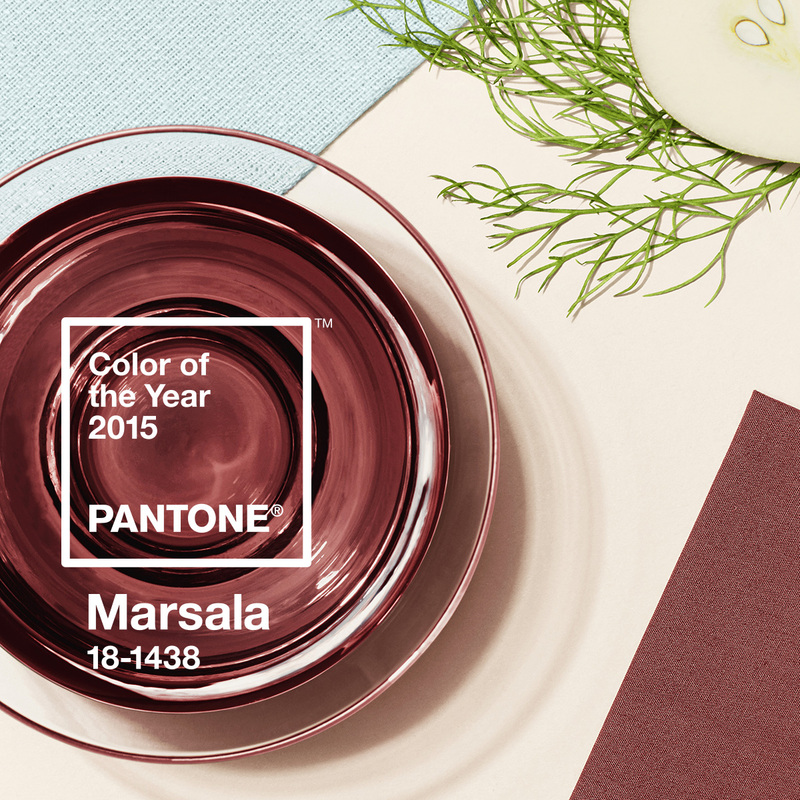 New Jersey-based color systems firm Pantone has announced that Marsala – an earthy shade of red – is its color of the year for 2015. “Marsala enriches our mind, body and soul, exuding confidence and stability … it’s red-brown roots emanate a sophisticated, natural earthiness,” said Leatrice Eiseman, the executive director of Pantone. Where that may be breaking news for the fashion world, a corporate marketer may want to know how it could, or should, affect branding strategy. Consider the upcoming trade show season. The team apparel for the associates managing the booth doesn’t always need to reflect the corporate logo color, as much as it does the spirit of the team. The logo decoration on the shirt or jacket will take care of the branding. The color and style of the clothing should demonstrate how you want the brand ambassadors, and thus the brand itself, to be perceived. The new color is likely to be used in fashion, beauty, industrial design, home furnishings and interiors. Since your customers are seeing it in the retail marketplace, they will recognize that your team, and your company, understand today’s trends and consumer preferences. When discussing your own products and services, that subtle message can be helpful. In addition to shirts and jackets, other accessory items could be used to add a contemporary flair to corporate giveaways. Hats, bags and wearable technology items are products that should be considered in this popular color choice. One thing to consider, however, when looking for promotional merchandise in colors other than the standard corporate blues, blacks, reds and greens, is the ability of product suppliers to match a PMS color for an all-over or accent-color imprint. Not all product suppliers have this capability, and not all products lend themselves to this type of decoration, but sometimes “close” is good enough to give you the up-to-date effect you’re looking for. It is undisputed that your customers expect to see familiar colors with your logo branding. But when there’s an opportunity to add a little “punch” to the branding message, consider the color that your audience will be seeing in retail, and likely bringing to their own homes. Marsala – like the wine! Every brand should have a twist in order to be heard over all the other brand noise in the marketplace. Whether it’s with a catchy advertising jingle that you can’t get out of your head; a fun-loving quirky spokesperson, like Progressive’s hugely popular “Flo”; or high-design merchandise like the Apple products, companies looking to appeal to their audience on an emotional level should always be looking for that edge. Fortunately, when it comes to distributing branded giveaways, stand-out designs don’t always mean expensive price tags. Furthermore, product designs that get noticed for one company aren’t necessarily the same types of products that a different audience would appreciate. As always, when choosing a great item for your next promotional gift, consider the audience and the brand message you want to convey, with a design that is fresh and a cost that makes sense for your budget. I’ve provided a few examples of practical products that also offer creative design elements. And, of course, all items have room for a logo imprint. Phone or tablet backstrap: Provides protection from surface scratches while giving you a place to hold cards or documents. Silicone speaker amplifier: Boosts sound on a smart phone up to 200% without external power source while holding the phone for easy media viewing. Wireless activity tracker: Count steps, calories, nutrition and sleep with a wrist device or less-expensive clip-on unit. Custom notebooks: Build a notebook with a custom cutout shape, insert pages, clip-in bookmark, usb pocket or dozens of other custom options. Performance fabric t-shirt: Moisture wicking, anti-odor technology changes the game for the next tee giveaway. Great product design comes in all shapes, colors and sizes. Those products stand out because the designs are fresh while their intended use still makes sense for the recipient. It takes a little more time to be creative, but it’s worth the effort when your customers takes notice!